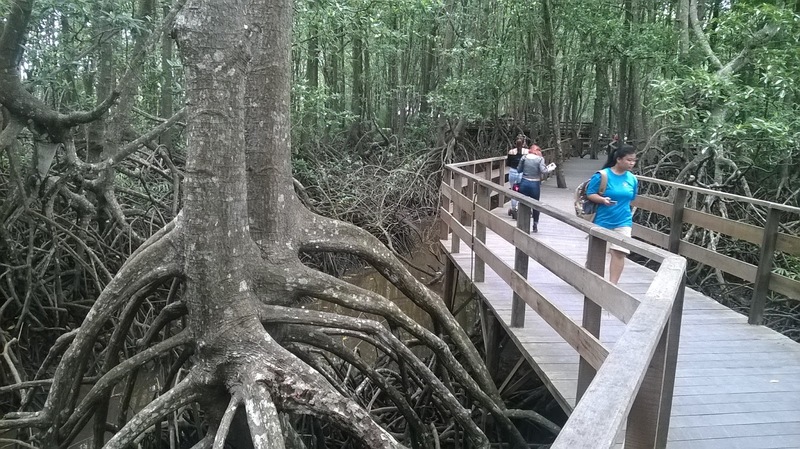 A few walks away from the "cowboy saloon" of Sabandar, we witnessed a 360 degree change of scenery but nevertheless very impressive; walkways into the mangrove jungle! The view here is definitely breathtaking! Colossal trees so tall and massive roots exposed because of the low tide in this mangrove swarm. Looking at all this, I am very happy yet worried. There is a golf resort in Tawau that used to have thick virgin jungle all around the course. It was one of the most beautiful golf course at that time. I vowed to come back and play there again. But when I came back, I was horrified when they chopped off all the huge trees and planted oil palm! The same thing could happen here. They protected these mangrove trees and make it beautiful initially just to get hold on this property. Once they got hold on it and it is legally theirs; suddenly they chopped off all these trees and build concrete jungle! That's my worry. But at this moment, it is really beautiful out here. Mangrove is an important part of the ecosystem. It protected the beachfront from erosion, and in certain countries against the destructive tsunami and cyclone. Mangrove jungle provide homes for several species of plants and animals; for example the Proboscis Monkey which can only be found in Borneo, live exclusively in mangrove wetland. Mangrove is also a breeding ground for many species of marine life.